The Vapur Eclipse water bottle is my new favorite water bottle. Until recently I’d never used a collapsible water bottle – I would either use a traditional hard plastic water bottle (a 32 oz. Gatorade bottle is my hard plastic bottle of choice) or, more often than not, a water bladder. I love using water bladders while I’m hiking. I find that if I use a bladder rather than a traditional bottle I drink far more water at a more constant pace. Having that drink tube easily available, so I don’t need to stop and pull something out of my pack, makes it convenient to drink while I’m on the go. Bladders aren’t so awesome when you get to camp you dump your pack, stash it in your tent, and go do other things. You no longer have a convenient way to drink water. While the bladder is great while you are on the move once you are sitting by the fire it is a huge annoyance to have your water bladder rolling around the ground with the drink tube being ground into the dirt. The solution is the Vapur Eclipse water bottle. While I’m hiking the Vapur Eclipse can be rolled up into a very small package and stashed in my bag – taking up very little room compared to a traditional hard plastic water bottle. Then, once I’m at camp, I pull out the Vapur Eclipse, fill it up from water remaining in my bladder and I can sit around the fire drinking Kool-Aid to my heart’s content. The Vapur Eclipse has a few stand out features that set it apart from other colapasable water bottles. I really like the lid that it has. 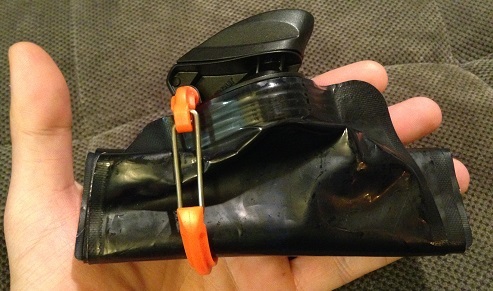 Rather than having a small plastic cap that comes off and can be lost it has a flip up lid that stays attached to the bottle. The Vapur Eclipse is made to stand upright when filled with water (another feature that sets it apart) but it is not as stable as a traditional water bottle, it will fall over sometimes. Having that lid keeps it from spilling when it falls over and keeps where you drink from getting caked with dirt. The major feature that I feel really makes the Vapur Eclipse awesome is that I can’t seem to get it to pop or open accidentally when I put pressure on it. I’ve tried stomping on it, dropping it and putting it in my pack and clinching the compression straps as tight as they will go. Nothing I do seems to cause bottle failure – this is critical. The other benefit to carrying the Vapur Eclipse while hiking, in addition to a water bladder, is that I can carry additional water if I need to for that one night we decide to not camp by a river. It can be filled with an additional 32 oz. of water and I don’t worry about it opening and drenching my sleeping bag accidentally. The 1.6 oz. Vapur Eclipse water bottle in “travel mode”. Something else to note: Vapur recently released a water purification filter (the Vapur MicroFilter) that works in conjunction with the Vapur Eclipse. 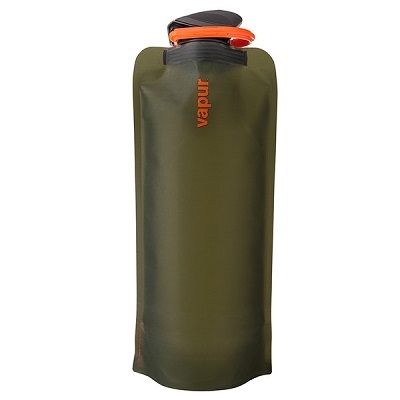 While I’ve not yet used it I imagine (based on the overall quality of products Vapur has produced) that it is awesome – so if you need a more compact, lightweight way to filter water in the backcountry I’d check it out for sure. One of the best $20 upgrades you can make to your backcountry setup. This entry was posted in Activities, Alpine Mountineering, Activities, Backpacking, Activities, Car Camping, Activities, Hiking, Product Review, Activities, Resort Skiing, Brands, Vapur, Gear, Water Bottles.